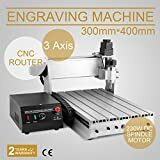 3040 CNC – Inkscape to Cut Out with ABS! Please visit ift.tt/1PJb2UK for more information on this and many other projects! As in this episode, we will be using Inkscape to design a part and then head over the CNC to cut out of some ABS sheet stock with a single flute cutter which has been working out well for us in the shop. ← 3D Printed Project – Finger Nut for the Y Axis on the 3040 CNC!